This entry was posted in Uncategorized on May 31, 2014 by Sherrill S. Cannon. Thank you, Cassandra Calkins…You are Awesome! 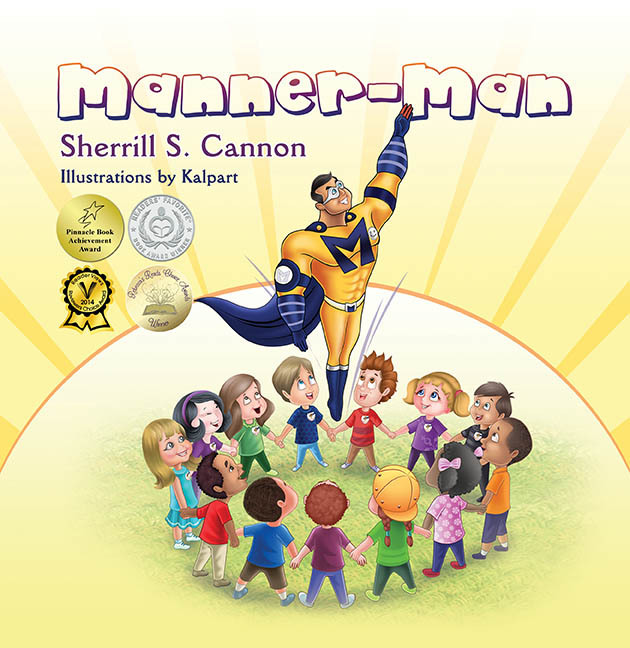 This entry was posted in Bullying, Children's Picturebook, CureJM, Manners on May 29, 2014 by Sherrill S. Cannon. This entry was posted in Uncategorized on May 29, 2014 by Sherrill S. Cannon. Kait Neese, Vice-President – Publish on Demand Global, wrote a wonderful recommendation for me on LinkedIn. I am proud to share it, and only hope that I can live up to it!! This entry was posted in Uncategorized on May 27, 2014 by Sherrill S. Cannon. Bullying can be stopped at an early age. 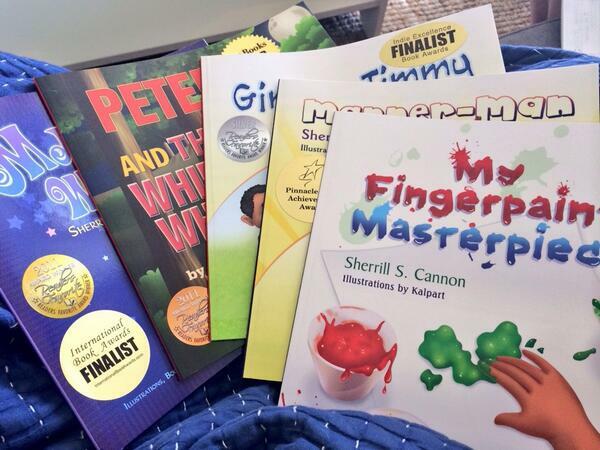 All of my award-winning books are part of a Fundraiser for the imbullyfree organizaion. 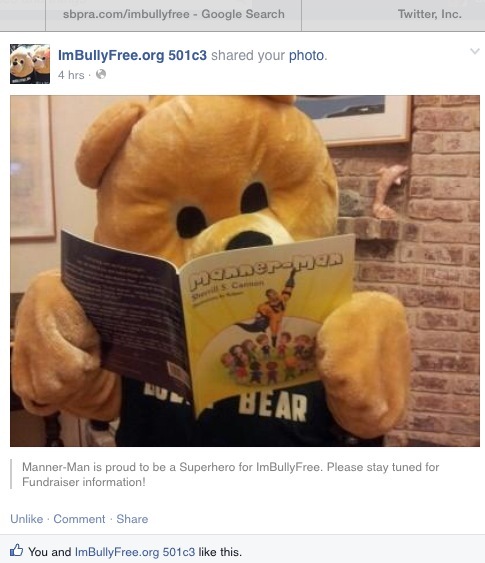 50% of the cost of the books goes to imbullyfree. Do you have a small child, age 3-8, who needs to be reminded of how to show consideration for others, and how to help stop bullying? 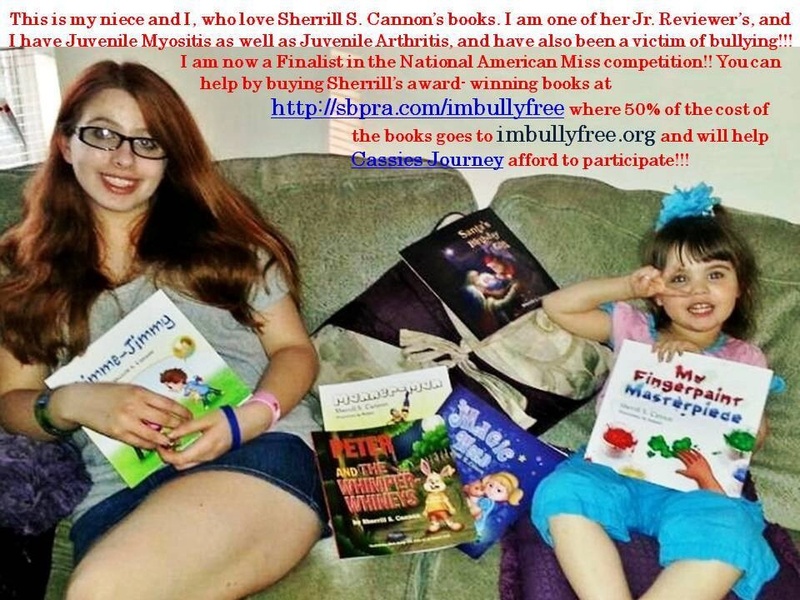 This entry was posted in Behavior, Bullying, Children's Picturebook, Consideration for Others, Manners, Superhero, Uncategorized and tagged Bullies, Bullying on May 26, 2014 by Sherrill S. Cannon. 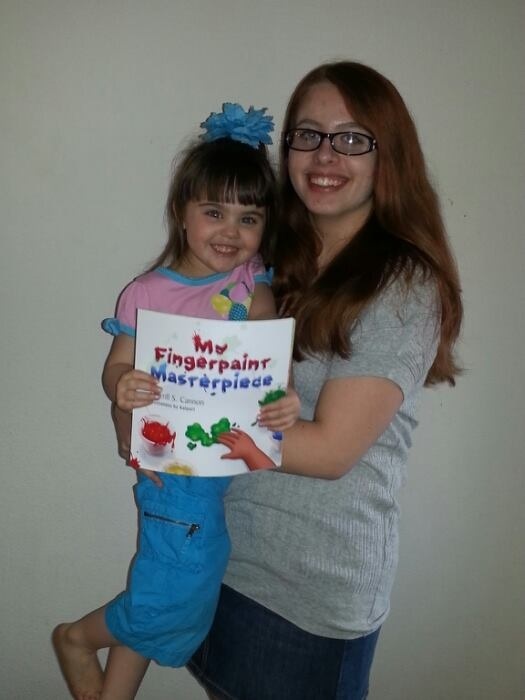 Naila Moon gave My Fingerpaint Masterpiece a “5 hand painted stars” rating – and even provided a video review. Ah, buy this book! Seriously! As I said in the title, it is worth every penny and ounces of paint you can find. I loved this book. The whole book is written in rhyme. So often books attempting rhyme falls flat but not Sherrill Cannon’s book. Her use of imagery is fantastic. To add to the already adorable-ness of this book are the illustrations. The brightness and realness of them is by far worth it all. I particularly loved the one page where the judge is looking sideways. That reminded me of being in art galleries and looking at art sideways with total wonderment. The expressions on the people’s faces are priceless too. There is also secrets in this book that I am not going to reveal here. If this is not enough, the book also recently won the Pinnacle Award for Book Excellence. If you are not familiar with the award, let me tell you that it is a big deal. As I said, buy the book and find out for yourself. 5 handpainted stars from me! 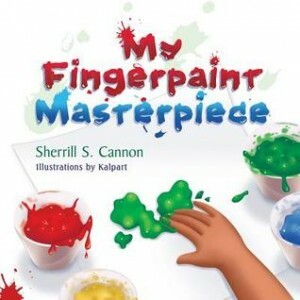 This entry was posted in Art, Children's Picturebook, Fingerpaint, Review, Self esteem, Uncategorized and tagged art, Award winning, Children's Picture Books, fingerpaint, perception, perspective, self-esteem on May 25, 2014 by Sherrill S. Cannon. Headed Home by way of Oregon and Washington! We are finally headed back east and decided to return home by way of Oregon and Washington, and made time to visit the beautiful Oregon coast on the recommendation of JoAnn Ross, the best-selling author who included one of my plays in her Christmas in Shelter Bay novella last Christmas (Part of Christmas on Main Street). She kindly provided some wonderful advice on places to eat with a view and also good food (not always the same!) 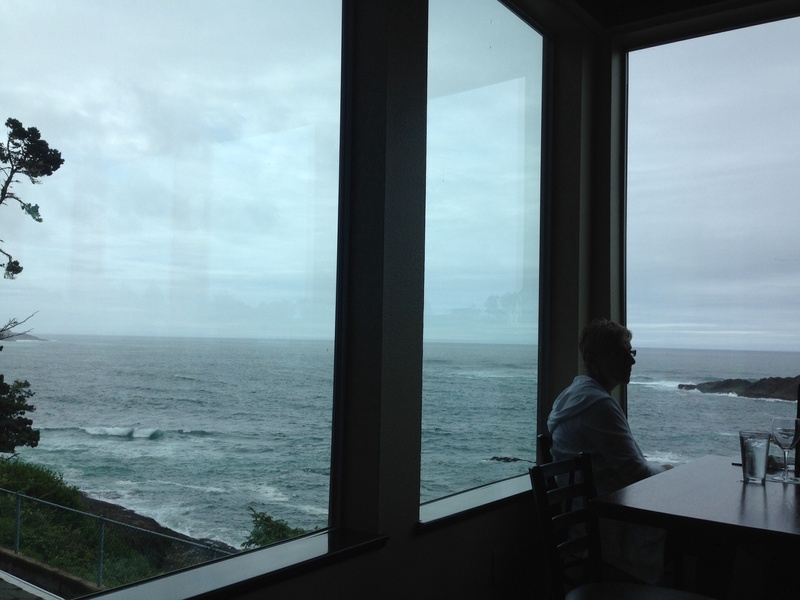 So we went to Tidal Raves in Depoe Bay for lunch. We had just been seated and were admiring the view when a toddler’s flip-flop landed in the middle of our table! Looking up, at the landing above us, a very apologetic father was telling us he was SO sorry (repeatedly) while his 2-yr old son looked on in wonder at what had just happened. Needless to say we all laughed and I assured him that as a grandmother of 10, this was more amusing than anything! I told him I was a children’s author & gave his son my card. Two minutes later, a 4-yr old girl was also peering over at us. Her Dad said that she wanted to meet a “real author”. So naturally she needed a card too. I then told him that the reason we were eating there was because of the recommendation of a “really” real author who had included my play in one of her books. When his wife found out it was JoAnn Ross, I REALLY became a celebrity! So I think JoAnn Ross has become a legend in DePoe Bay! This entry was posted in Uncategorized on May 24, 2014 by Sherrill S. Cannon.